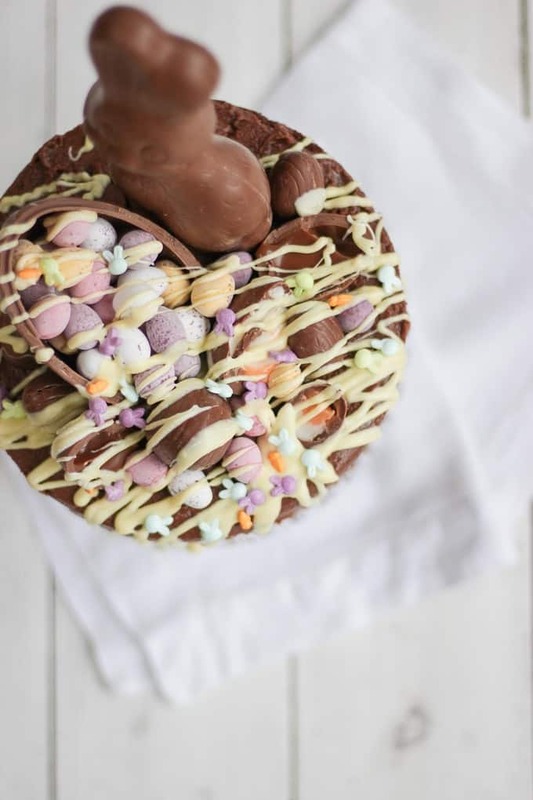 Overload on Easter treats with this decadent, delicious and rich Easter chocolate cake. 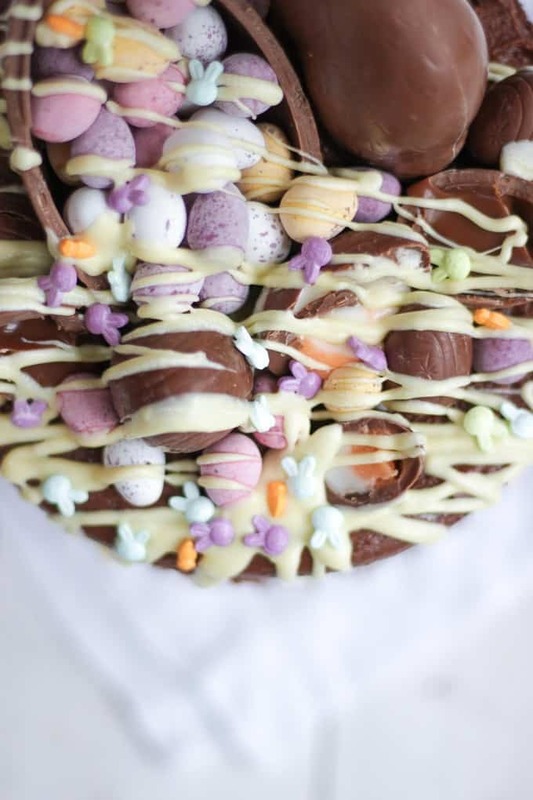 Topped with Cadbury’s Creme Eggs, Mini Eggs, white chocolate drizzle, bunnies and Caramel Eggs. 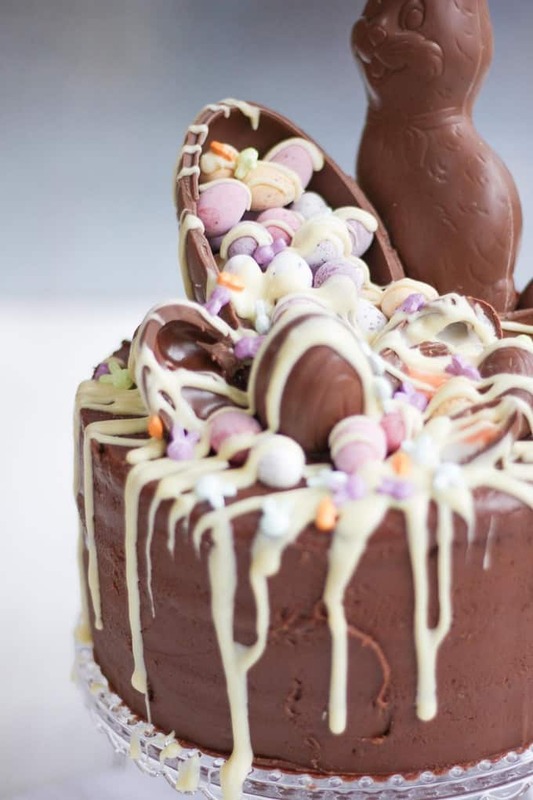 What more could you need in an Easter dessert?! I just love Easter, the feeling of Spring in the air, four days together as a family and no pressure of perfection, shopping and seeing everyone like at Christmas. Whether you’re religious or not, Easter is such a lovely time to come together isn’t it? And if you’re getting together.. You need cake right? A couple of weeks ago, I made a YouTube and Facebook video showing how to make my No Bake Creme Egg Cheesecake Recipe. Oh my goodness, the Facebook video went a bit crazy. It’s been viewed 4.4million times. It’s here on Facebook if you fancy a peek. I love blogging for the fun of getting better at taking photos, learning more and sharing, it’s also now become my job. BUT there’s something so special about the thought of hopefully helping to bring a little bit of dessert enjoyment to so many homes this Easter. Will you be making the cheesecake? Please send me a photo if you do, I love to see them. Anyway, on to this Easter Chocolate Cake.. I know not occasion is suitable for a no bake cheesecake, sometimes we need good old chocolate cake don’t we? 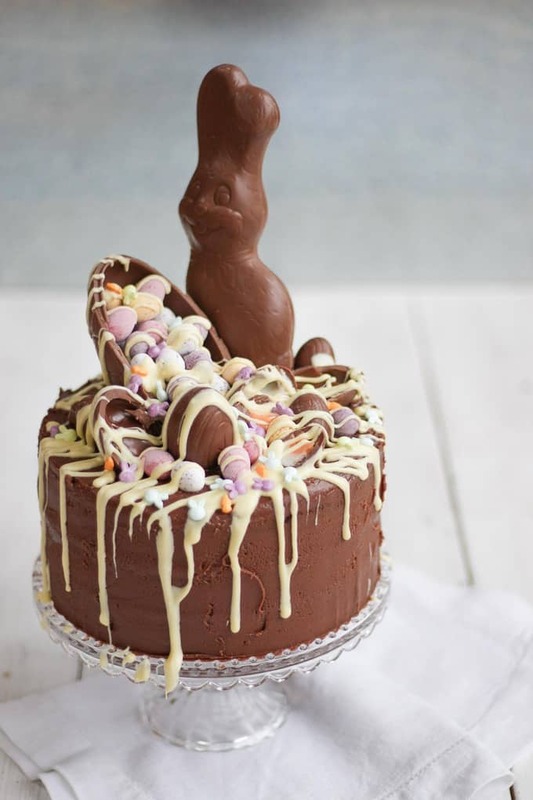 What’s on your to bake list for this Easter? Are you bulk buying Easter treats too?! As always, don’t trim and ice the cakes until they are completely cold. If you don’t have them and fancy making layer cakes now and again, the two things that will improve the look of your cakes the most are these little beauties; an Angled Palette Knife (about £4 on Amazon) and a Cake Side Scraper (about £2 on Amazon). Honestly, they make SUCH a difference! This icing can be a bit temperamental as it is so fudgy. If it looks like it has split a bit DON’T PANIC! Just continue and put it onto the cake. As soon as it goes harder it will come back to a lovely consistency. A chocolate layer cake like no other! 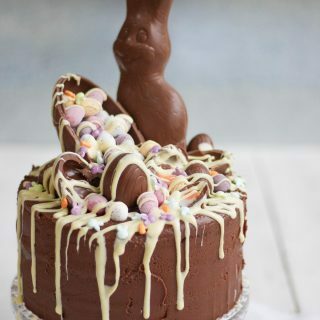 Embrace the chocolates and make this indulgent chocolatey cake at Easter. A mountain of Easter chocolate goodies! Stir in the melted and slightly cooled chocolate and milk. Beat in your icing sugar and then add the melted and cooled dark chocolate. Mix well. Top each layer with a spread of your chocolate buttercream, stack up and then smooth over the sides and top. Top with your Easter treats, using a little of the melted white chocolate to stick them on if needed. Then drizzle the white chocolate all over! 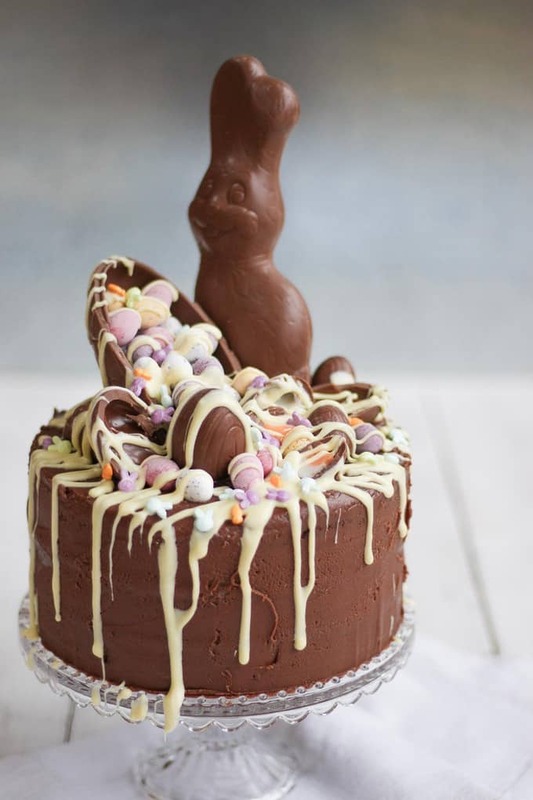 Pin the this Easter Chocolate Cake Recipe for later..
Sarah – I LOVE this cake! Awesome! I’m going to try it too. I just made my version of the Cadbury cheesecake and I had a question. What brand white chocolate are you melting to drizzle? I ordered the yellow gel you suggested from England and it still made my white choc seize. I tried it with chips then a white choc baking bar and even yucky white bark – ALL of them seized when I added the yellow so I ended up with just choc and white drizzle. Thanks! Hi Elizabeth, sorry you had that trouble! You can add some more liquid to it, or warm it up a little more again. There’s some info here: https://www.cooksillustrated.com/how_tos/5712-how-to-fix-seized-chocolate I use a chocolate all Callebaut (this one: http://amzn.to/2o85h9n) it’s great, but even that still seizes sometimes. I add a little water or even cooking oil, and warm it a touch more, to smooth it out. Hope that helps! THANK YOU!!! Although mine wasn’t nearly as beautiful as yours, it was a BIG HIT with my book club, and I had to fight to save a single slice for my hubby. I’ll make it again for my family at Easter and try the tips for the yellow. Are you in the UK? They were from Home Bargains! They are fab! What a gorgeous cake! Great presentation. Do you always use cocoa in your chocolate cakes? I find instant coffee can do the job quite nicely too if you don’t have the budget for high end cocoa. Great tip for cake trimming and icing. I should heed this one as the cake is a billion percent easier to work with when cooled but I am sometimes quite impatient, hehe. Hi Leigh, no need to store in the fridge (unless the weather is very hot!). Just keep covered in a cool place. Enjoy!